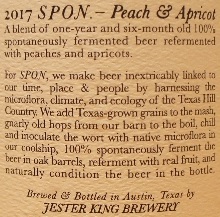 Brewer Description: (from bottle) 2017 SPON – Peach & Apricot. 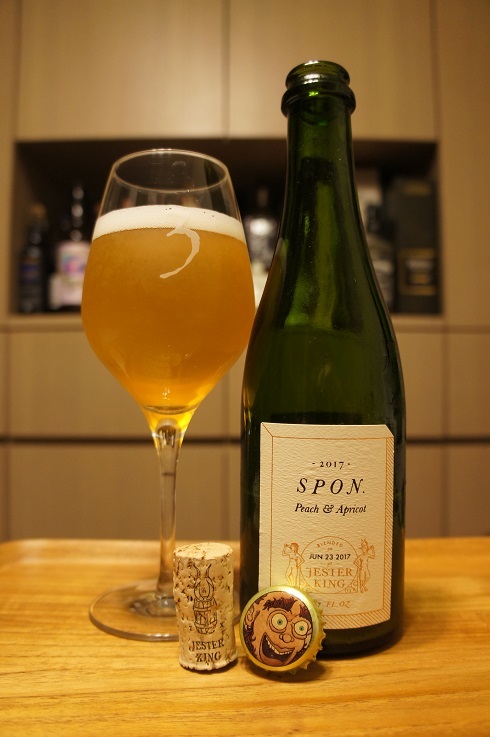 A blend of one-year and six-month old 100% spontaneously fermented beer refermented with peaches and apricots. For SPON, we make beer inextricably linked to our time, place & people by harnessing the microflora, climate and ecology of the Texas Hill Country. We add Texas-grown grains to the mash, gnarly old hops from our barn to the boil, chill and inoculate the wort with native microflora in our coolship, 100% spontaneously ferment the beer in oak barrels, referment with real fruit, and naturally condition the beer in the bottle. Intro: A 12.7 fl. oz. bottle, 2017 vintage, blended on 23rd June 2017. Poured into a 3 Fonteinen stemmed glass. Appearance: A lightly hazy golden colour (turned hazy light orange near the end) with a one finger white head that dissipated fairly quickly and left only sparse to no lacing. Aroma: Tart, peach, apricot, light gummy candy, funk, wet hay and a hint of wood. 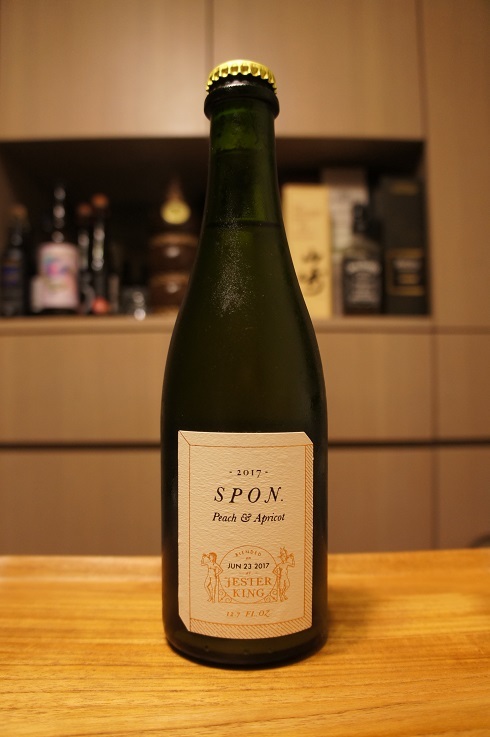 Taste: Sour, tart, sour peach, apricot, sour gummy candy type sour and sweetness, vinous white grape, funk, orange pith with light vinegar and wood on the finish. Overall: Nice peach and apricots plus gummy candy coming though. Funkiness seemed a little on the light side, but not a problem at all.